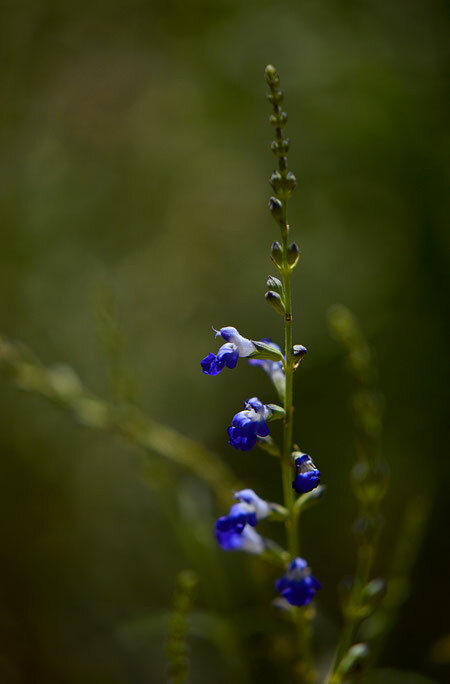 Today's vase, as well as the rest of my post, was meant to be about the brilliantly blue Salvia reptans. 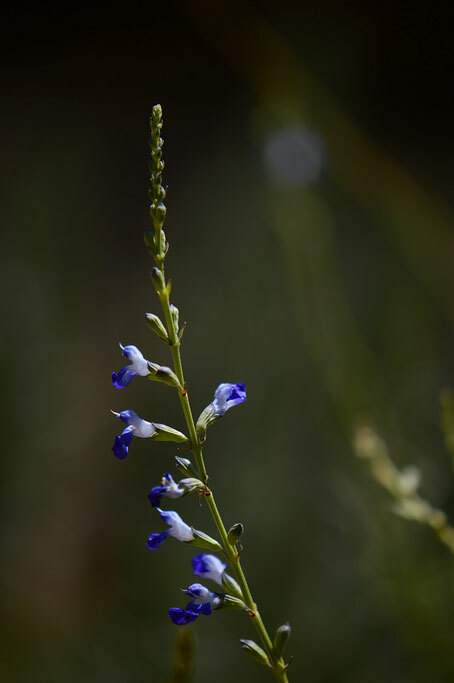 But it is a minuscule thing, all wispy stems, slender leaves, a few spots of bright blue, and the sunlight shining through. So a couple of others slipped into my vase alongside it. 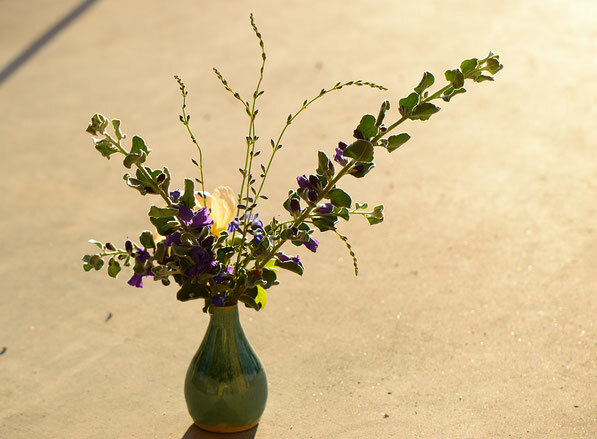 Dwarfing its little flowers are the robust blooms of Leucophyllum pruinosum 'Sierra Bouquet', each bloom something between a trumpet and a bell, and sweetly fragrant with an odor reminiscent of grape jelly. 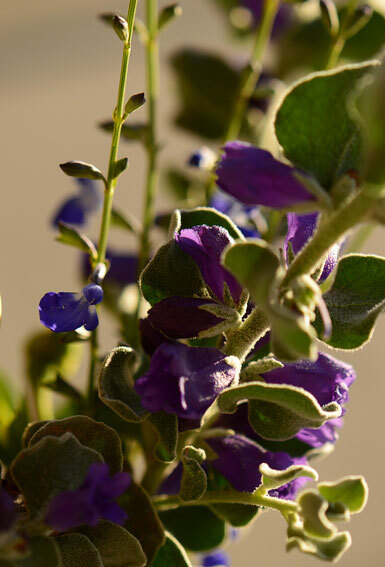 Their color is a dark purple, and the leaves are pale and somewhat furry. Here they are together with the Salvia. Then a rose, the creamy yellow of Wollerton Old Hall, just beginning to return to bloom and still a little wispy in its own right. The flower, that is; the bush is bent on taking over the Central Bed and climbing up to the roof. 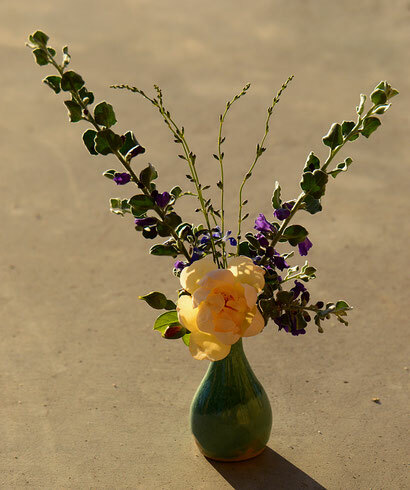 That was all: a rose, some Leucophyllum, and a touch of Salvia. 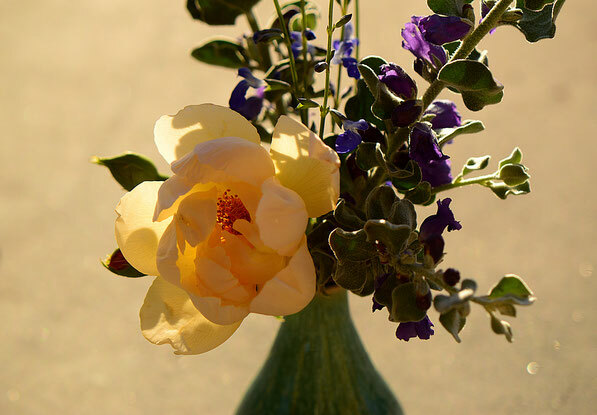 It's likely to be a fairly transient bouquet as the two last don't hold their blooms very long. But one might as well enjoy them indoors for a day or two! 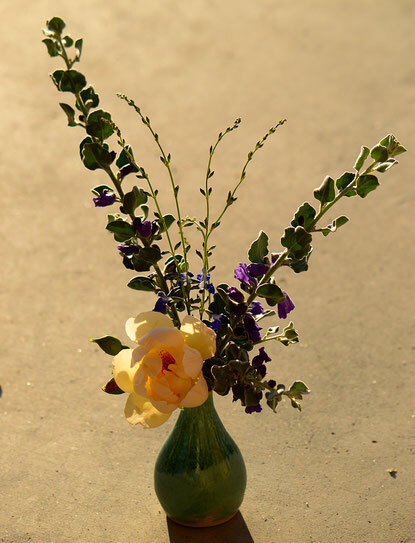 Thank you to Cathy for hosting In a Vase on Monday! Do check the other vases for this week! Salvia reptans is the most distinctly seasonal of the Salvias that I grow. It is autumn-blooming, rather than tossing off flowers in spring and autumn and perhaps warm days in winter, as most of my others do. No, Salvia reptans blooms with the cooling of late September and doesn't seem to last particularly long, though admittedly the bloom season may be longer once it is better established. At any rate, it is unexpectedly splendid while it flowers. 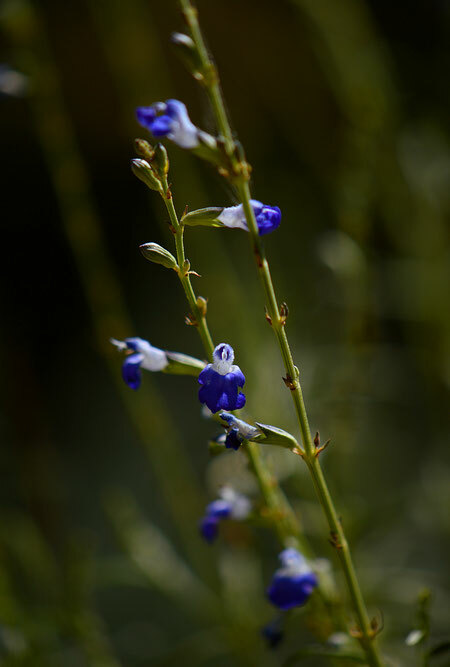 The tiniest of brilliant blue dots adorn a wispy plant with narrow leaves. It isn't much to look at out of bloom. But the blue is worth the growing, a clear, saturated cobalt accented, in this variety, with frosted white hoods. When my first S. reptans failed to survive transplanting (actually it failed to survive the combined rigors of transplanting and a very difficult summer - it is quite a tough plant), I replaced it with this one, S. reptans "Sapphire Skies'. The species is said to be hardy to USDA zone 6 (-1o F/-23 C); online advice recommends the West Texas form, which is the only one I have seen available. This plant was purchased from High Country Gardens. 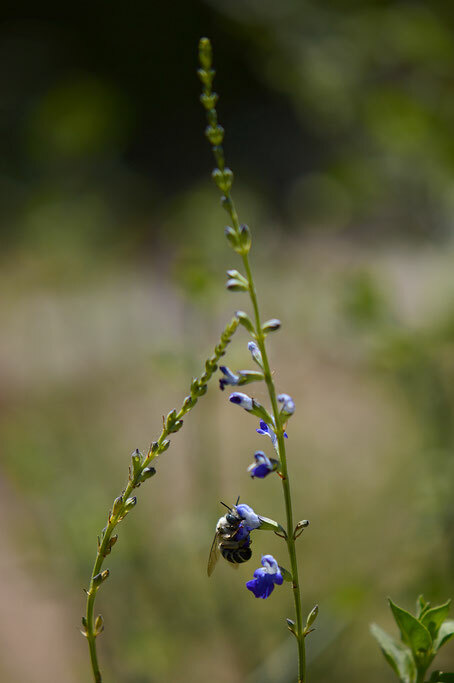 Fortunately this Chihuahuan Desert native can also take low desert heat when well established. It is, of course, very drought-tolerant but has greatly enjoyed our recent rains. While the blue of that Salvia is heavenly, I think you should take any opportunity to show off your equally gorgeous roses, Amy. Based on your weather summary, it appears we're enjoying similarly pleasant temperatures at the moment. I'd be ecstatic if only we could get a little rain too. 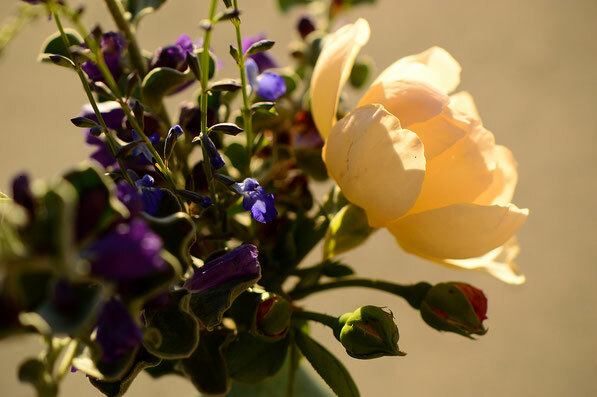 Kris - It's been a relief to see the roses come slowly back to life; the quickest to recover are Wollerton Old Hall, Crown Princess Margareta, and The Alnwick Rose. I'm still surprised the rain didn't make it all the way to the coast; hopefully that will happen yet! Totally agree about the wonderfully cool temps! Sierra bouquet - I fall for enchanting names every time! Diana - Wonderful name, isn't it? I'm afraid my description was a bit confusing as it is the leaves which are furry - kind of a chenille look. They are quite grey, however - one of the coolest-toned silvers I have grown. Can't understand why the whole family is known as 'sage'! You're right: Scrophulariaceae, and very woody shrubs at that! Cathy@Words and Herbs - That bright blue needed a rose, didn't it?! ;-) I love the blue Salvias!